A mostly rigid, cylindrical space suit. It was a tiny cylinder, just big enough to hold a man— and it did hold a man, for I could see his head through the plastic panels covering one end of the device. Long, jointed arms projected from the machine's body, and it was trailing a thin cable behind it. I could just make out the faint, misty jet of the tiny rocket motor which propelled this miniature space- ship. And this will give you a bit more details. To most people, the word "space suit" conjures up a picture of something like a diving dress, in which a man can walk and use his arms. Such suits are, of course, used on places like the moon. But on a space station, where there's no gravity, your legs aren't much use anyway, because outside you have to blow yourself round with tiny rocket units. For this reason, the lower part of the suit was simply a rigid cylinder. When I climbed inside it, I found that I could use my feet only to work some control pedals, which I was careful not to touch. There was a little seat, and a transparent dome covering the top of the cylinder gave me good visibility. I could use my hands and arms. Just below my chin there was a neat little control panel with a tiny keyboard and a few meters. If I wanted to handle anything outside, there were flexible sleeves through which I could push my arms. They ended in gloves which, although they seemed clumsy, enabled one to carry out quite delicate operations. Tim threw some of the switches on my suit and clamped the transparent dome over my head. I felt rather like being inside a coffin with a view. 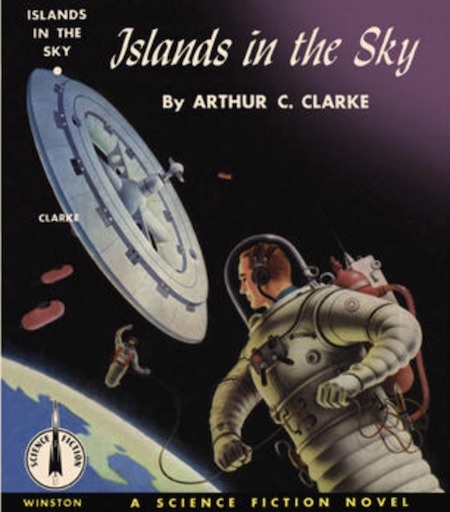 From Islands in the Sky, by Arthur C. Clarke. Compare to air-tight suit from Edison's Conquest of Mars (1898) by Garrett P. Serviss, the space bubble from The Planet Strappers (1961) by Raymond Z. Gallun and the Osprey space armor from Salvage in Space (1933) by Jack Williamson.